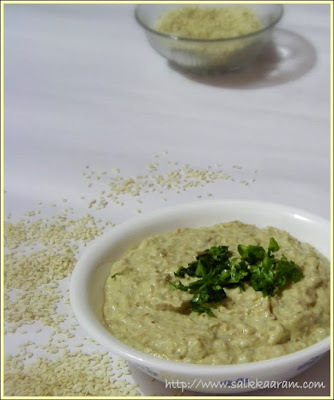 Eggplant Dip / Baba Ghanoush / Baba Ghanouj | Simple and Delicious ! Those fat relatives have been throwing the same query every time when we meet them." Oh, they don't have the look of Gulf kids, are you making them slim? (Gulfilninnum vanna kuttikalanenne thonnilla, nee avare chappathi koduthu unakkukayano..? )" I am not bothered about those fat question marks, but wondering why those ladies are compelling kids to take rice? Keralites consume much rice regularly and get a big stomach as an outcome..mmm? 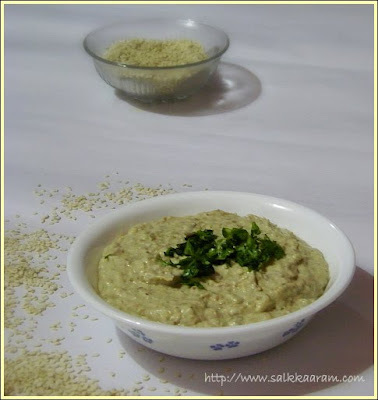 Normally I wouldn't spend extra time for cooking kids' food, they are ready to eat chapathi / bread / rice given with hummus or garlic paste or with eggplant dip etc. They love middle eastern food , I believe that is the real healthy way of eating! Mash it using grinder or food processor. Crush garlic and grind in a grinder with thahina,coriander leaves, lemon juice, salt and olive oil. Finally mix with brinjal paste. If it is not easy for you to grill or bake eggplants, peel it , chop and saute in the olive oil. Wow one of my favorite dip. Looks so perfect. Yummo!!!! Thanks for sharing. Its the same story with us,lot of surprised faces when during our last visit home.Cutting down rice consumption has definitely made my family slimer. Assalamu alaikum,this is kids favourite other than hummus..looks really good ..thanks for sharing recipe..will try soon..
Assalamu alaikum,this is one of kids favourite..thanks for sharing the recipe,must try soon. Excellent looking Baba Ghanoush. Lot of flavors. Eggplant dip looks very flavorful! Wa alaikkum salam, Yasmeen and Aysha! The Eggplant dish is so tempting and very healthy!!! Its so easy to make too!!! Love the color!!! Yummy dip, i am also waiting for your thahina recipe. This is this is one of two ways only that I like eggplant but in order for me to eat it, the eggplant has to be fire roasted. Coming here after a long time. Forget about those "well-meaning" comments.....first they'll complain about how thin the kids are and then later, if they do put on weight, about how fat they are. There's nothing to do but grin and bear it. Wow! This is my fav too. I was searching for this recipe and I'm glad I found it here. Thanks a lot for this recipe seena. We love this dip and I am going to try this today..